Nasi Pecel is rice served with cooked vegetables and peanut sauce, very delicious. 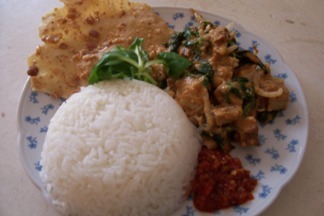 For Indonesian people this is one of the cheapest dishes that they can make it. You can see that everywhere on the street in the cities you can buy this kind of food. Cheap, healthy and delicious, what a combination isn’t it? Make a paste of peanuts, if you use pestle and mortal, it would be heavy. Use food processor if you have. It’s easier, and spare so much time. But you need to know that you can only add the peanuts in the processor without any other ingredients. Wet peanuts make it heavier for the processor. Keep dry, and you would get the best results. Set aside. Make a paste of Birdseye chilies, garlic, aromatic ginger, terasi, brown sugar and salt. Add this paste into peanut paste, and make a smooth mixture. Add water as much as needed. The paste has to be not too thin and not too thick. Just in between. Add Sweet soya sauce. Stir it until the mixture is well done. Add more salt and sugar if needed. And the sauce is ready to use. Put all vegetables including tofu and tempe on the plate. Pour some peanut sauce, and mix it until well. Served with Rempeyek kacang or teri and sambal.